Soil is the home of the fruit tree, and as such, everything possible should be done to make it as pleasant as possible for the trees to live in and happily produce crops for the next 50 years or so. A basic error is made by just digging a hole and shoving the tree roots in the hole, covering them with soil and forgetting about it. In most cases this will lead to great disappointment, with trees desperately struggling to survive. Fruit trees are very sensitive. Particularly the first year after planting. 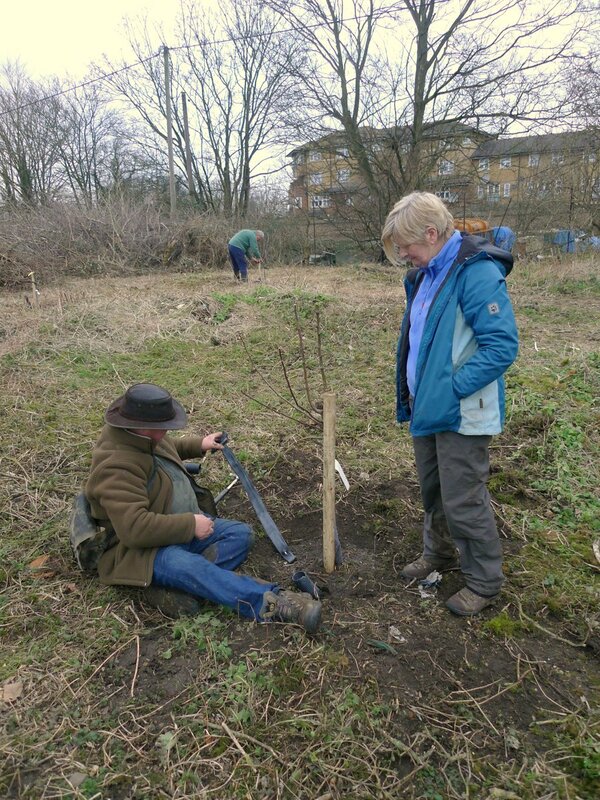 Usually if planting is carried out correctly, then the first step has been made to ensuring that the trees do well. It is often forgotten that the parts of the tree below ground level, the roots of the trees, must be able to function well, in order to support the numerous demands of all the remaining parts of the tree above soil level. If the soil is well drained, oxygen levels around the tree roots will be sufficient to create the energy enabling the roots to grow. If for whatever reason the oxygen of the air in the rooting zone is suppressed, trouble will be brewing. For example if soil compaction is the cause of limiting oxygen supplies around the roots, the tree will be struggling throughout its life. It will be subject to tree diseases such as canker. This in turn will greatly reduce the life span of the tree, apart from a serious reduction in the keeping quality of the fruit. Secondly the depth of the soil and its organic content is of great importance. Without the cooperation of various beneficial micro-organisms surrounding the root tips of the tree roots, uptake of nutrients will become impossible. These micr- organisms work best if the soil has a good level of organic matter. All types of well-matured farmyard manure, are a real stimulus for all round good development of tree growth and regular cropping. If you live in a location with soils where rhododendrons and azaleas do well, it is important to test the acid level of the soil. Fruit trees will do best with a pH of 6.3 to 6.6 . Outside these parameters, the uptake of certain nutrients may become be a problem. It is easy to determine the pH of the soil . In good garden centres for little money you can purchase a pH meter. Most soils will need regular applications of nutrients. Fruit trees do best in the long run if the soil nutrients are applied in the form of organic manures. Additional foliar feeding will be very helpful if certain elements are short. This is not a regular occurrence if the soil has been looked after over many years in the past. Pure sandy soils are often problematic for fruit trees as the water-holding capacity is very low. At the other end of the scale, heavy clay is a difficult type of soil for roots to develop well. The closer the soil is to a deep loam the better the trees will perform. These soils will hold a lot of water between the soil particles. This is of great importance particularly during droughty conditions. After all, water is the life blood of the tree. Without sufficient water the tree will die.